People are a company’s single most important asset. As such Reward and Recognition is of paramount importance in retaining, motivating and thanking your staff, dealers, suppliers and customers. Everyone wants to feel needed and cherished – our products are perfect for that. Consider for a moment the huge value of having your company’s logo in front of your customers on a product that they will use everyday and love. 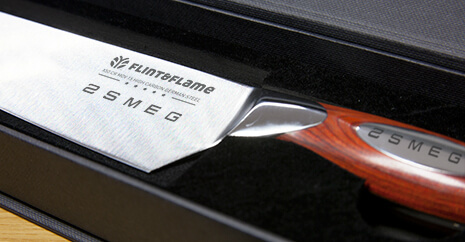 Our knives are the perfect gift, and with your logo on the front of the knife what better way to promote your business. These stunning knives are perfect for rewarding employees in the workplace. Whether it’s for an outstanding achievement, all-round hard work or something a bit more innovative, we’ve got it covered. Our sets could be used for high quality awards specifically for sales, leadership and team efforts, or we have individual knives that can be personalised with your engraving to suit the purpose with your logo and personalised message. Our products will stand out at any corporate event or work presentation night, encouraging employees to work hard to win one or build a set. We have awards for every budget ensuring that you are able to show your recognition for the leading employees. Our Corporate Awards can help, whatever your requirements or company’s budget. Success & awards go hand in hand and we know the value to any team’s spirit of winning an award, from sports to films all the top achievers receive awards, and business should be no different. 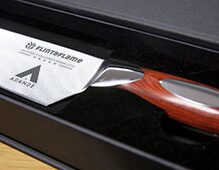 Everyone likes to be acknowledged for their efforts and there is no better way to mark such an achievement than by presenting your employee with one of our high quality, personalised Flint and Flame knives. This is not only an award that is stunning in appearance but is going to be used daily rather than collecting dust. Let’s face it where do most people end up at any party? That is right in the kitchen, so a beautiful Flint & Flame knife is the perfect gift to get them and you talked about. Corporate Awards provides the means to improve the self-esteem & self-worth of your most valuable resource of all – your employees! We offer the means to make fantastic impressions at extremely affordable prices. Giving long service awards from our extensive range of products provides the best value for any budget. Our products are high quality and stylish, and because corporate awards can be individually personalised they will be cherished and used by the recipient. If you would like to discuss having your company logo engraved on our knives, please call us on 01403 740 230.